The second wedding of the fall season takes place between a great couple, Rachel and Mike. 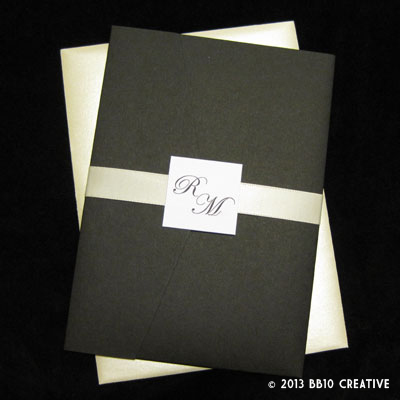 Rachel came to BB10 Creative looking for a unique invitation using their wedding colors of black and ivory. 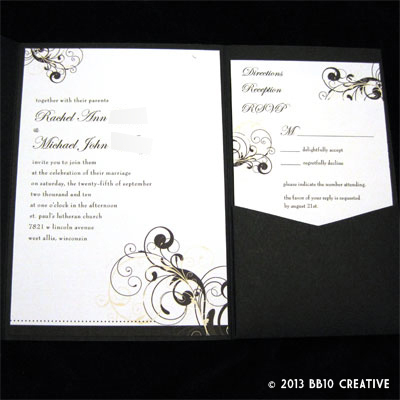 She was looking for something simple, classic and elegant and preferred an enclosure where the invitation would sit on the left and the cards on the right. With all of those things in mind, I met with the cute couple for our initial consultation and we went over paper swatches, enclosure types and design ideas. Armed with all the information I needed, I came up with several design options and we were able to narrow it down to the final design: A very elegant black and ivory scroll design with a black pocket enclosure. We used a more traditional serif font paired with an elegant script. The pocket enclosure is held shut with a lovely ivory satin ribbon and monogram patch on the front. 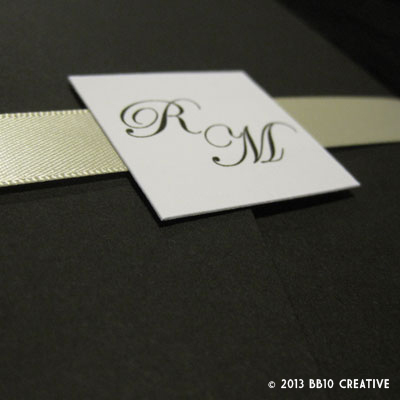 The ivory ribbon really complimented the ivory metallic envelopes we used for mailing and looked great together. 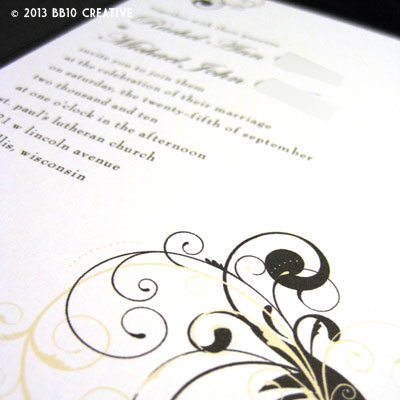 We printed this invitation on a clean white linen cardstock, which helped the ivory color to pop in the design. Overall I am really happy with how these turned out and I know the soon-to-be happy couple is too! I really like how light and elegant the design is, and the black and ivory combination is so classy. Rachel and Mike liked the designs so much that they have decided to incorporate as much as possible into the wedding – so I was able to help create the programs, place cards, table numbers, wedding shower invitations, thank you cards and even monogrammed stickers for the wedding favors. 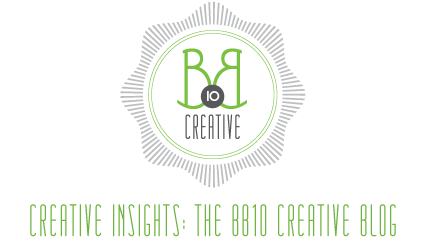 More pictures to be posted on BB10 Creative soon, and our Facebook Page as well. Stay tuned for September Wedding Number Three: Ashley and Matt!